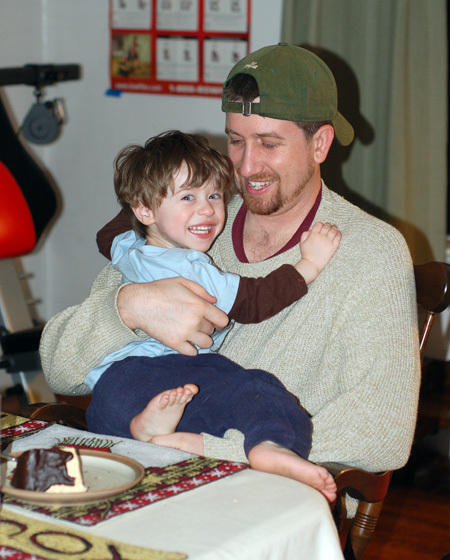 My baby is a baby no more: I am now the mother of a 2-year old supertoddler. 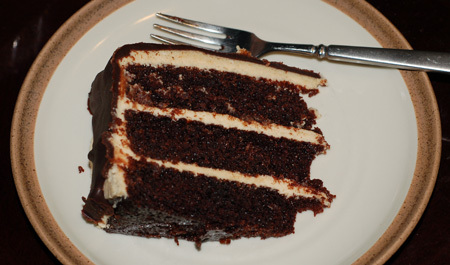 We celebrated the day with Mr. Potatohead and chocolate peanut butter cake with a ganache glaze. The toy was a smash hit, but Nolan had his eye on the cake from the moment I started frosting it. When I set it down on the table to photograph, he saw his opportunity and pounced. 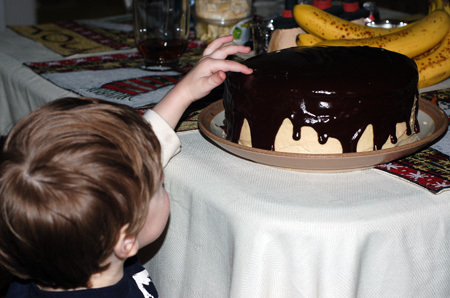 We ended up with a big gouge in the ganache and a chocolate-faced boy, but it was his birthday after all. After that, Nolan went in the high chair—extremely impatient for more—and I cut proper slices. This is a very moist, rich, decadent cake, perfect for a birthday celebration, and we enjoyed it over the course of several days. I made a few minor tweaks to this cake. I had plain yogurt, so I used that in place of the sour cream. I only had two 8-in round pans, so I opted to use 9-in pans instead. I was a bit short on peanut butter, so my frosting was a few tablespoons short, and I used almond butter in the glaze; I also had to make about 2 cups of powdered sugar from granulated sugar in my spice grinder, which worked perfectly. Preheat the oven to 350 degrees F. Butter the bottoms and sides of three 8- or 9-inch round cakepans. Line the bottom of each pan with a round of parchment or waxed paper and butter the paper. Sift the flour, sugar, cocoa powder, baking soda, and salt into a large bowl. Whisk to combine them well. Add the oil and sour cream or yogurt, and whisk to blend. Gradually beat in the water. Blend in the vinegar and vanilla, then whisk in the eggs and beat until well blended. Scrape down the sides of the bowl and be sure the batter is well mixed. Divide among the 3 prepared cake pans. Bake for 30 to 35 minutes, or until a cake tester or wooden toothpick inserted in the center comes out almost clean. Let cool in the pans for about 20 minutes. Invert onto wire racks, carefully peel off the paper liners, and let cool completely. To frost the cake, carefully place one layer, flat side up, on a cake stand or large serving plate. Spread 2/3 cup cup of the Peanut Butter Frosting (below) evenly over the top. Repeat with the next layer. Place the last layer on top and frost the top and sides of the cake with the remaining frosting. Allow the frosting to set before decorating. 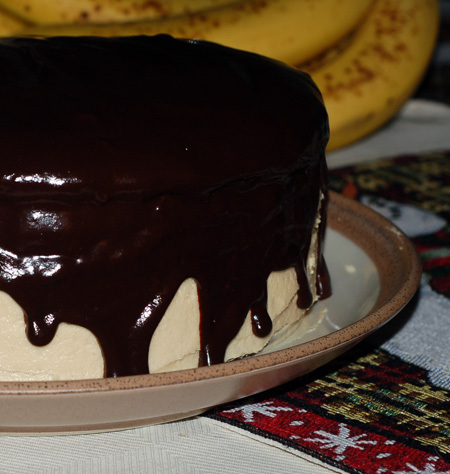 To decorate with the Chocolate–Peanut Butter Glaze (below), put the cake plate on a large baking sheet to catch any drips. Simply pour the glaze on the center of the cake, and use an offset spatula to spread it evenly over the top just to the edges so that it runs down the sides of the cake in long drips. Be sure to work quickly, while the glaze is warm; retouching once it has started cooling will mar the glossiness of the glaze. Refrigerate, uncovered, for at least 30 minutes to allow the glaze and frosting to set completely. Remove about 1 hour before serving. In a large bowl with an electric mixer, beat the cream cheese, peanut butter and butter until light and fluffy. Gradually add the confectioners’ sugar 1 cup at a time, mixing thoroughly after each addition and scraping down the sides of the bowl often. Continue to beat on medium speed until light and fluffy, 3 to 4 minutes. 1. In the top of d double boiler or in a bowl set over simmering water, combine the chocolate, peanut butter, and corn syrup. Cook, whisking often, until the chocolate is melted and the mixture is smooth.